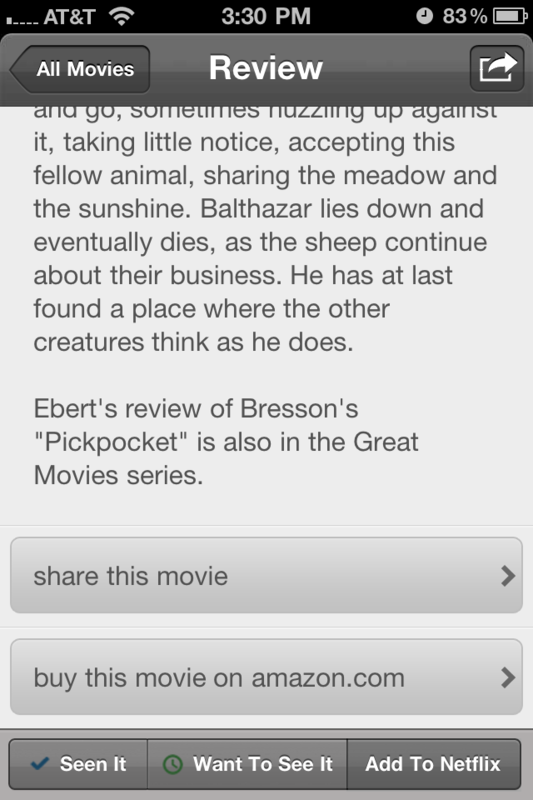 It’s difficult to overestimate the value of Roger Ebert’s film reviews when he is chewing on a classic film he loves. The Great Movies, Ebert’s collection of critiques of the best of cinema, has long been a go-to standard among cineasts as a defining list of film that should be both seen and understood. Published in several editions, these books can often be found on the shelves of many film buffs, and I know my own copies are well worn, with the tables of contents all highlighted to oblivion as I’ve kept track of what holes remained in my education. Now, as wonderful as these physical books are, it’s a huge joy to find that they’ve been collected in a brand new iOS App that makes them more accessible than ever. 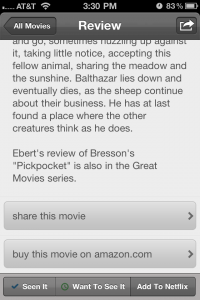 Now those who have a more casual relationship with Ebert’s writing may wonder what make this such a great thing. To be honest, I haven’t exactly been quiet about my feelings that Roger Ebert may need to hang up formally reviewing films for good at this point. I’m sad to say that these days his reviews are all too often unengaged, factually inaccurate, and/or filled with uninspiring tangents or moral judgements. Now the thing is, I still very much want this content from Ebert, and the inspiring enthusiasm with which he has adopted blogging warms my heart quite frequently. He should continue to publish whatever thought strikes his mind on the blog and his twitter, but it’s a bit disturbing to see reviews like this, which read like first-draft blog posts being counted among formal reviews and then being aggregated into scores that are (unfortunately) important stamps that will stick with a film. Those thoughts aside though, I’ve always maintained that what made Ebert so valuable as a critic is not any particular ability to discern a good or bad movie (I often disagree with him on those calls), but that there are few writers that can so perfectly capture exactly what it is about a great film that makes it so great. Sometimes we see a film that washes us over with profundity, one that we know is great and has touched us deeply, but may not be able to put into words why. It is at these times that critics can show their value, and Ebert has traditionally been among the best of delicately bringing forward some of the strands from the fabric of the film, and providing a nice entry point for examination. The Great reviews tend to be short and simple, but plant the seeds for any film viewer to begin the long, rewarding process of digesting a great movie. In the case of a film you’ve seen many times and know well, Ebert has a knack of illuminating a heretofore unseen trick of the filmmaker or bit of context that offers a new road of thought down which to travel. • Reviews look great on a retina display, with the chosen film frame heading each piece, the pertinent cast/crew/release information up top. • When you look through a review, it includes “next” and “previous” arrows that let you turn through the reviews without returning to the index. This does default to the alphabetical sort however. • Bottom of each review has a “seen it” “want to see it” and “add to Netflix” button. 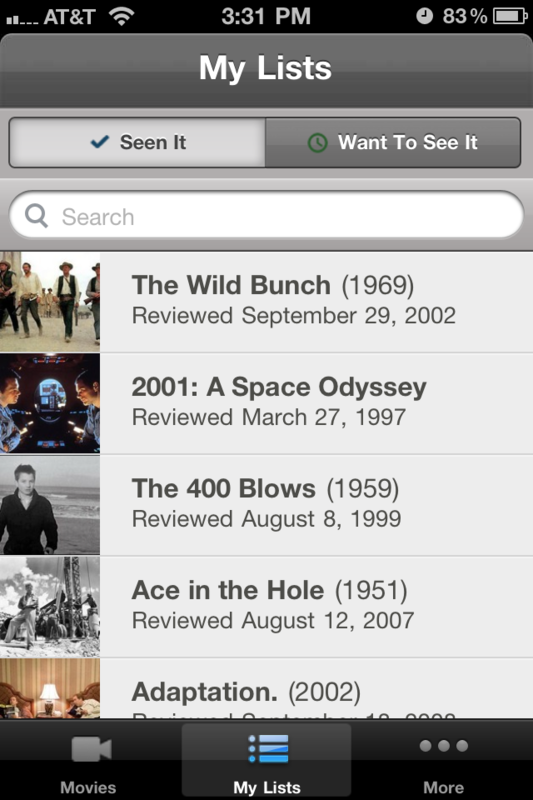 Your “seen it” and “want to see it” lists are both accessible from the main menu as their own sorted collections. Each review also has an extension menu that lets you read the review online, buy it on Amazon, add it to your queue, share via Facebook/twitter/email, or read it on Instapaper. • Typography size should be customizable, at least with a small, medium, or large setting. • Not optimized for iPad, which seems like an unnecessary shame. 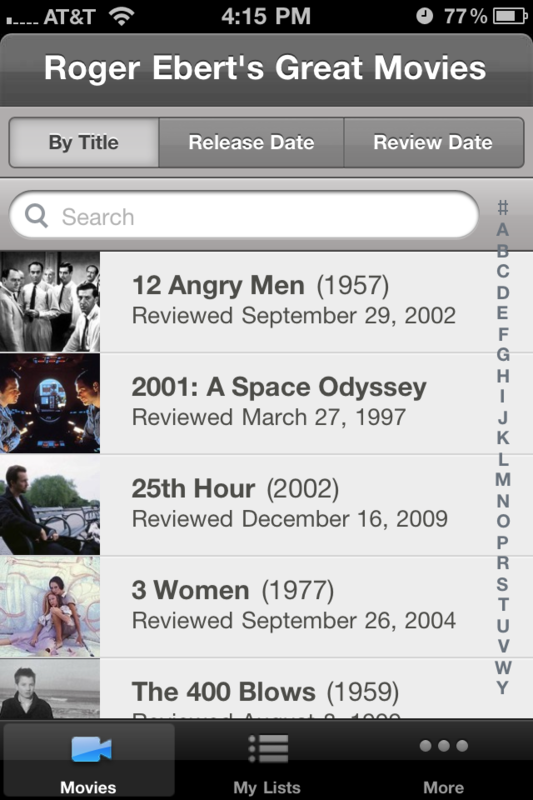 • When in a review and using the “next” and “previous” arrows, it would be nice if the app remembered from what sorting order you accessed the review (alphabetical, release date, publish date) with the arrow buttons corresponding to that same list order. 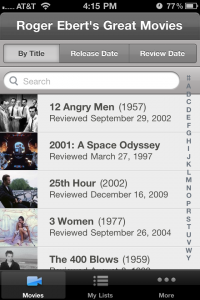 Currently they default to alphabetical listing, no matter what. 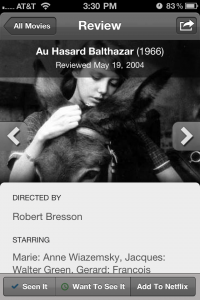 I’ve already had fun with the app, and gotten lost in a couple of reviews for my favorite movies. These really are special pieces of film writing, and you’d be a foolish iPhone owner/ film lover not to snag this. 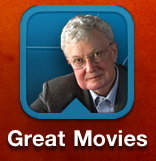 You even get a nice shot of Ebert smiling out at you as the icon!